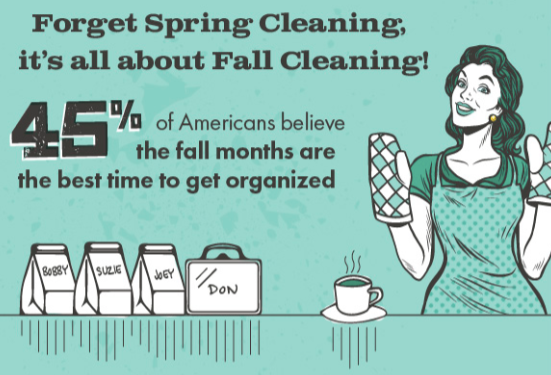 As the leaves begin to change, and spring cleaning is but a distant memory, fall cleaning and organization are knocking at our door! And according to the latest polls from Sparefoot.com, we’re welcoming them with wide, open arms. So long, do-nothing summer; hello, let’s-get-organized fall! Sorry, spring cleaning, but it looks like fall’s a favorite. 22% of Americans cite September as the best month to get organized, helping to make for a seamless transition back to the structured life and activities of autumn and winter. However, it appears that reorganization may not last for very long. 39% of Americans say that less than one week after school starts, they’re disorganized again. And how do the different age groups rank with their temporary tidiness? It appears Millennials struggle the most, with 46% admitting they’re back to their disorganized ways in less than a week, compared to 34% of Gen Xers, and 36% of Boomers. It appears many think of reorganization with an “out of sight, out of mind” attitude, shifting their stuff to parts of the house where they’re less likely to come across it in their daily routines. There are many places in the home that become natural places for clutter to gather. Americans typically have three areas in their home they turn to for storage, and the garage is one of them. Post a Daily Routine – Start with a location to post a daily to-do list—helping children establish routines for homework, reading, bedtime, etc. Designate Gear Storage Space – Who wouldn’t like to eliminate morning chaos? Designate a specific location for bookbags, lunch boxes, shoes, etc. Label Everything – How can everyone manage his or her to-do lists better? By having everything labeled—boxes, bins, and even their time. Clean As You Go – Save hours later on by cleaning up as you go now—straightening the kitchen while cooking, hanging up clothes as soon as you’re done with them, etc. Prepare food the night before – When you’re throwing together breakfast on the go and organizing lunches for everyone on busy mornings, you’re bound to feel overwhelmed. So make breakfast and prepare lunches the night before as often as possible. Shred-a-thons! Get rid of old tax records, checks, employment records, credit applications, or other documents containing confidential information that is currently adding clutter to your home. Here’s a list of places and dates in Wake County holding shred-a-thons in October. Starting the new season with a clean and organized home can set the tone for the next nine months. So go forth and conquer! And if you find you need assistance with the going forth and the conquering, I’m here to help. Contact me and we’ll go forth and conquer your clutter together.